Chillin’ with the LA Phil. I just pulled into my parallel park upon my arrival at work when my cell phone rang. 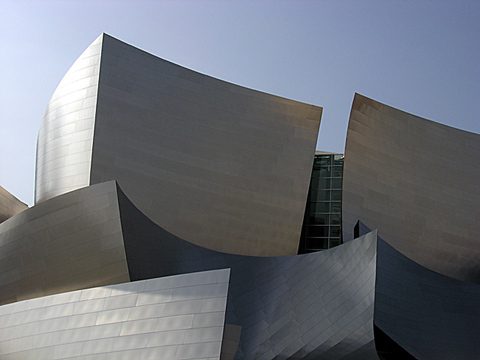 It was John: a co-worker of his offered him tickets to the LA Phil. I’m hesitant. I’m thinking: it’s a “school night”, I’ll have to leave work early, what about the commute?, what am I going to wear? We ended the call with a few “well-if-then…s” and a promise to report back. We both took a few minutes to meditate, look up the program online, and come to our senses: “uh – YEAH!” (hey, I’m not a morning person). And so we went (Wednesday, March 26). I have to admit that an evening out on a weekday does not have the same ‘vibe’ as the weekend. It carries that pall of having to report to work the next day and lacks that sense of relief and celebration that goes with “WEE!”-kend. Despite traffic warnings (for a concurrent event at Staples Center), we made it in time with a small margin of elbow room. The amuse-bouche for the evening was Franz Hasenohl’s riff on Richard Strauss’s Till Eulenspiegel: Till Eulenspiegel – einmal anders! It was familiar but I couldn’t place it for its Gerschwin-esque play on the piece. It was delightfully comical and I eased back into my seat (3rd row orchestra – just to brag) for the rest. Next came Mozart’s String Quartet in C major, K. 515. From where I sat, the cello was a little strong, functionally, however, the performance set the scale: tuned the audience for the intimate acoustical scale (and demand: no coughs or candy wrappers) required for chamber performances. The audience, despite a gracious pre-concert address and plea (by Martin Chalifour) not to applaud between movements, applauded between movements (I think he may have given a mixed message). I could see the ensemble players exchange grimaced-smiles as they endured the well-meaninged assault on their performance. Intermission came. I wasn’t feeling so good. My tummy was gurgling for having a quick bite instead of dinner and “I hear” the acoustics at Disney Hall are ace. I was considering sitting out the second half and wait for John until the end of the performance so as not to compete with the ensemble. I decided to persevere – a worthy decision. The performance of Mozart’s Clarinet Quintet in A major, K.581 left me spellbound. There was a noticeable chemistry among the players (Michele Zukovsky, Martin Chalifour, Gustavo Dudamel, Dale Hikawa Silverman, Peter Stumpf). Michele Zukovsky’s virtuosity (clarinet) was intoxicating and her interludes were well-balanced by the rest of the ensemble (one minor, squeeky critique: some phrasing in the Larghetto seemed to exceed breathing scale and distracted-in an impressive way- just a hint). The Larghetto, especially, was phenomenal. It closed, spinning itself (and me along with it) into that silence and pause between movements. I was suspended and there for a brief, quiet moment I wished and prayed: “…please, no applause…” …and the audience applauded. I sighed and the Quintent proceeded. Overall, the performance was exquisite. I left with the feeling of having seen a really good movie: the story and the plot were focused, the characters were fleshed-out, the acting drew you in. Bravo! What’s more, is, I heard the Larghetto again the next day on KUSC for the “anti-road rage” piece at 5:00 pm. The performance I attended was recorded and I’m pleased to report: you canNOT hear my stomach grumbling (did I mention the 3rd-row orchestra seating?). Thank you Simon and De-Ling!